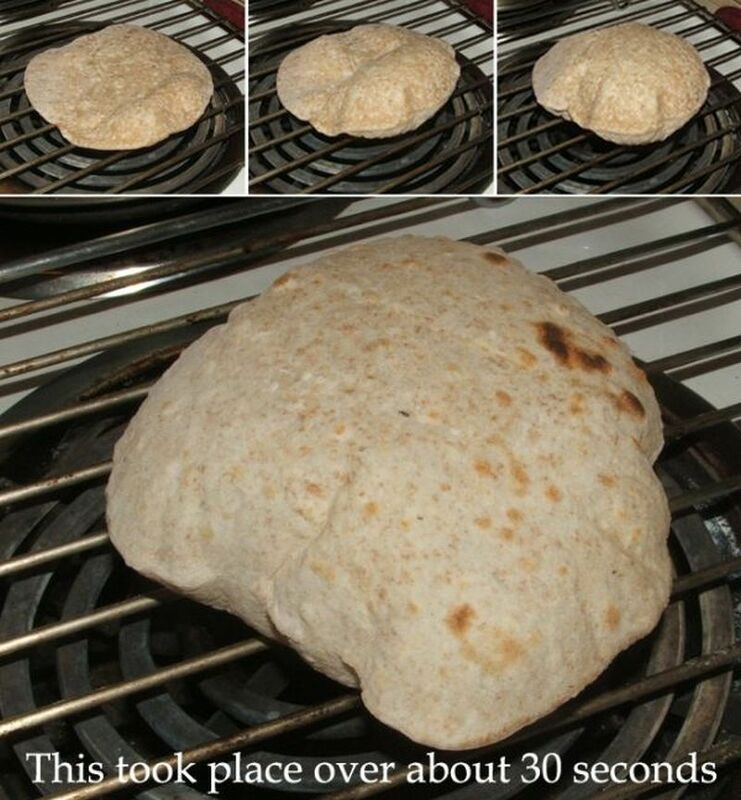 This lean Indian-style bread is made with just three ingredients: wheat flour (mixture of all-purpose and whole wheat), just boiled water and salt. 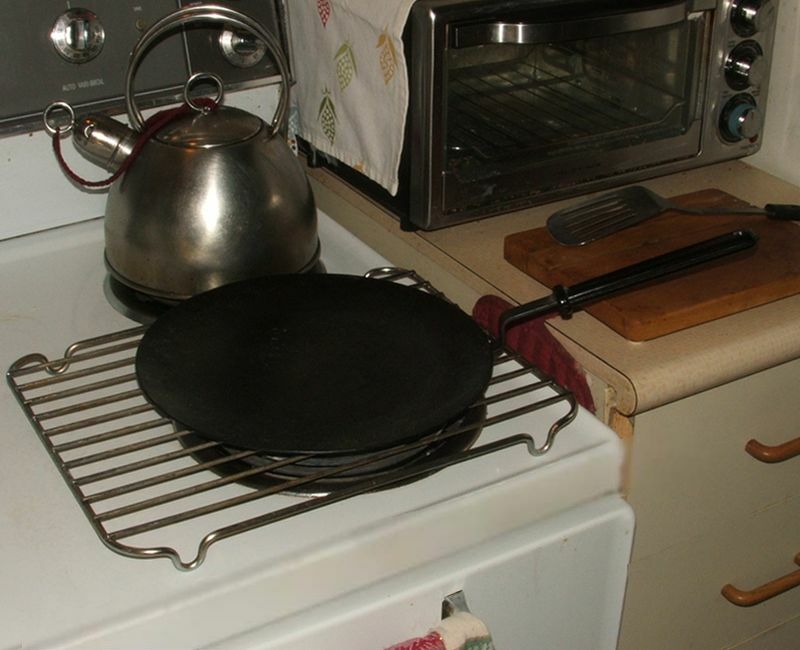 We cook the bread using our tava (carbon steel pan) and a rack placed over the burner at medium high heat on our electic stove. 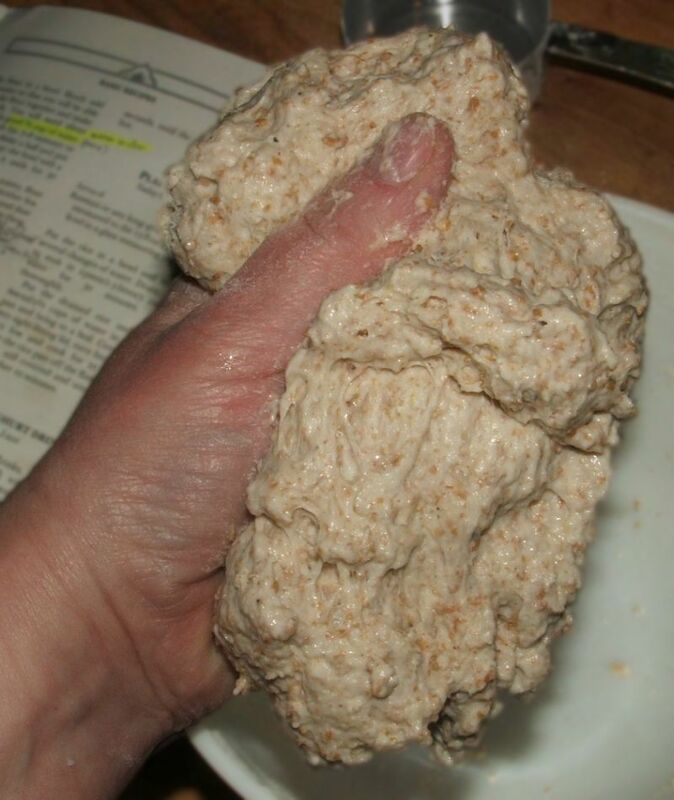 This is how the dough looks just after it's mixed. 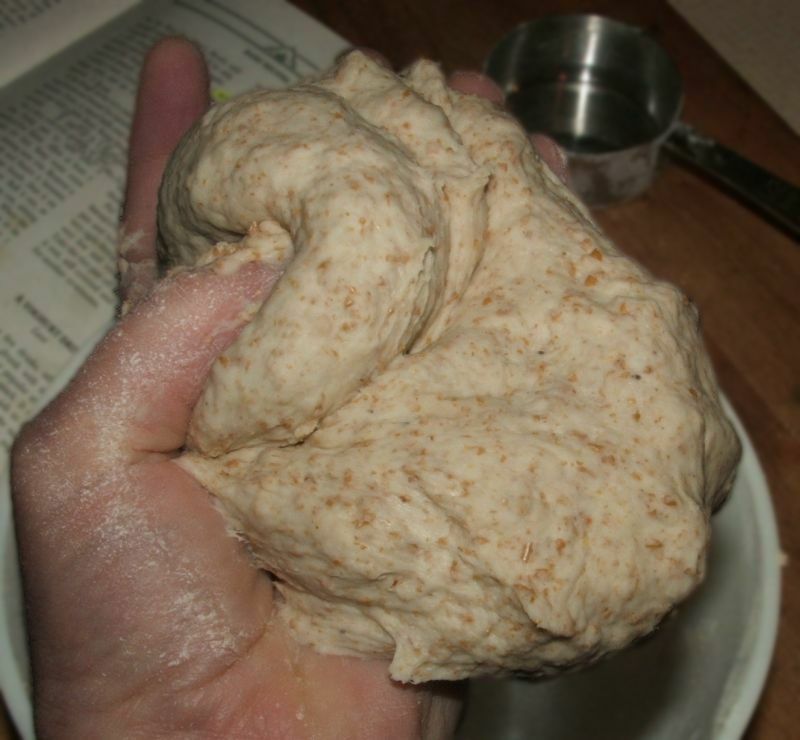 After about 10 minutes of hand-kneading in the air, the dough becomes very smooth. 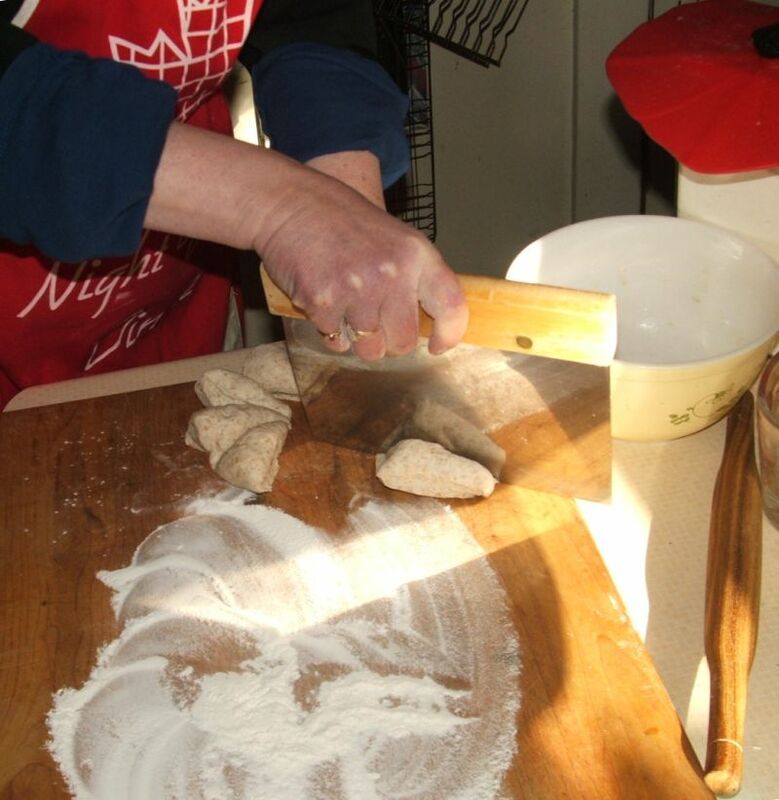 One of the keys to making good chapatis is to cover the kneaded dough and let it rest for at least 30 minutes. 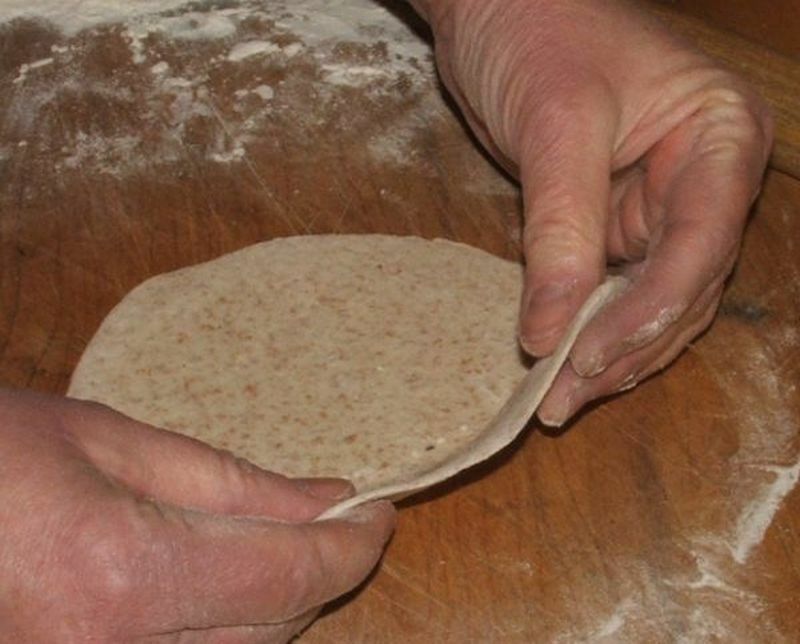 Roll it out until it is about 2 mm thick. Procedure: 1.) 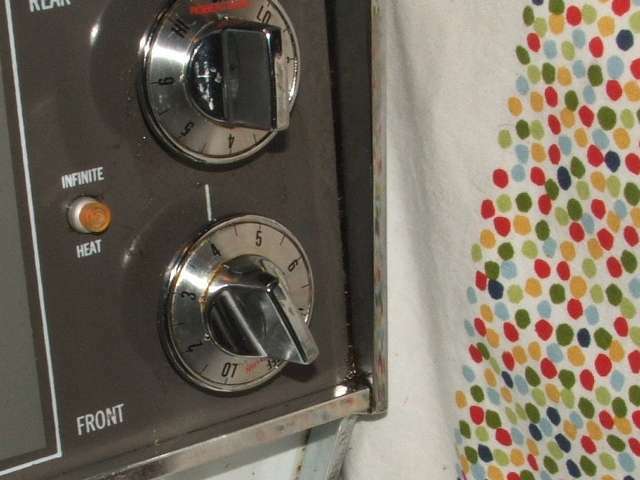 place just-rolled disc on UNoiled hot tava; 2.) look for little bubbles and uniform lighter colour; 3.) turn over for bubbles on both sides; 4.) 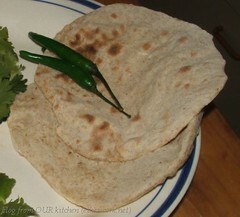 move chapati from tava to rack over med high to high heat; 5-8.) 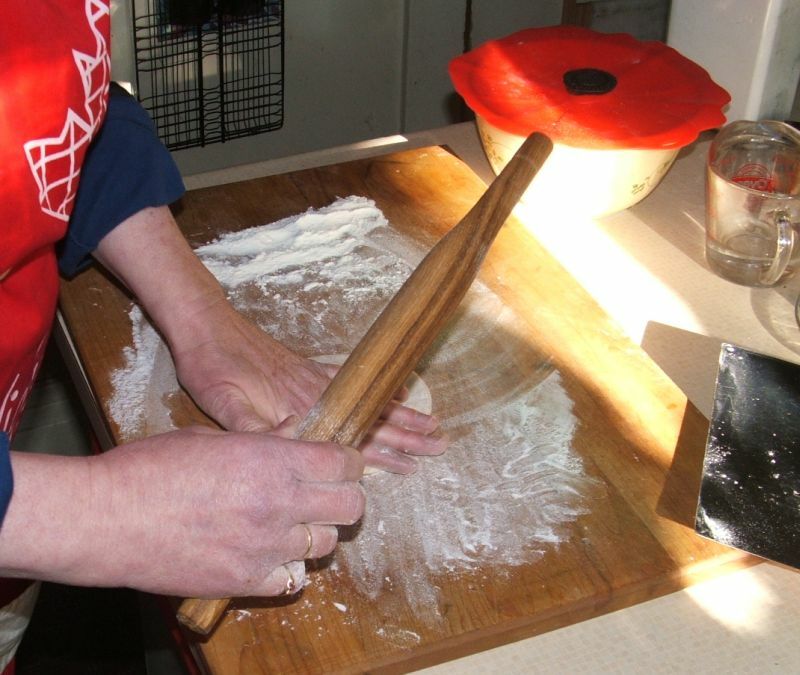 use tongs, if necessary, to move the chapati around on the rack so it puffs all over. 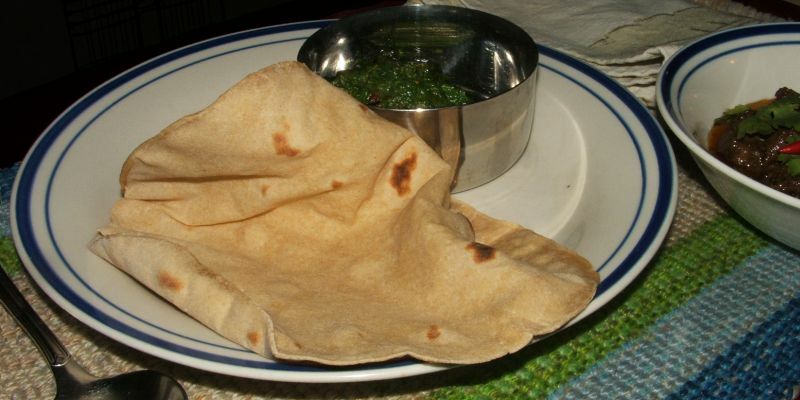 Sometimes a little hole causes the chapati to deflate. 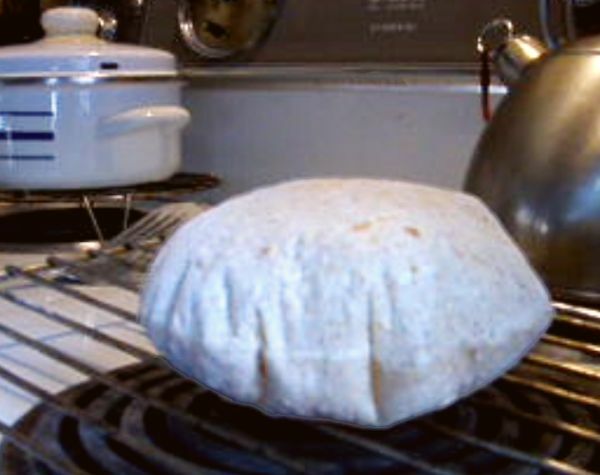 Don't worry; the bread will still taste good. 9.) Patting gently on the top can encourage puffing. 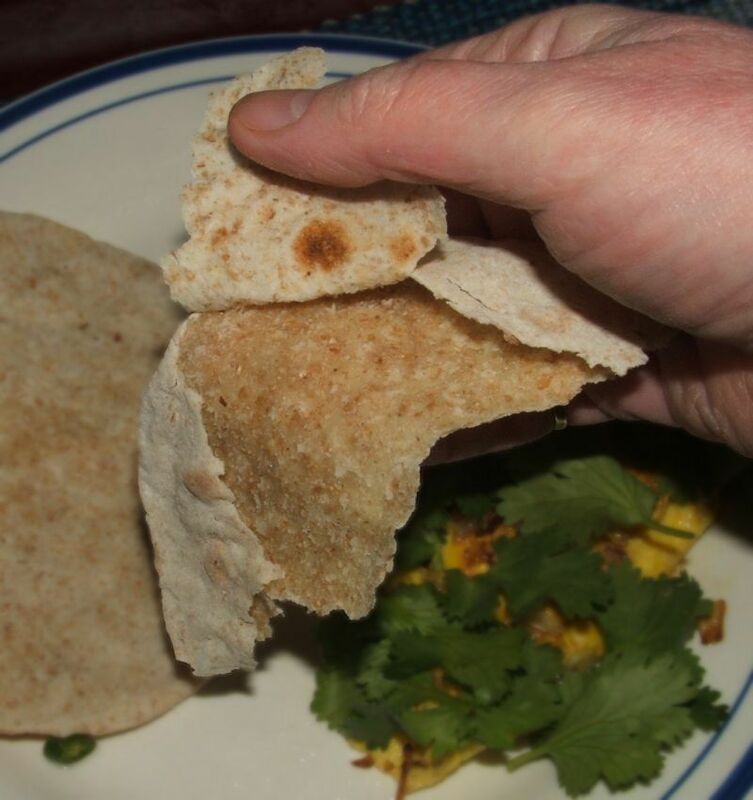 It takes about thirty seconds for the chapati to puff up; usually it does so without any encouragement. Except for the cheering. 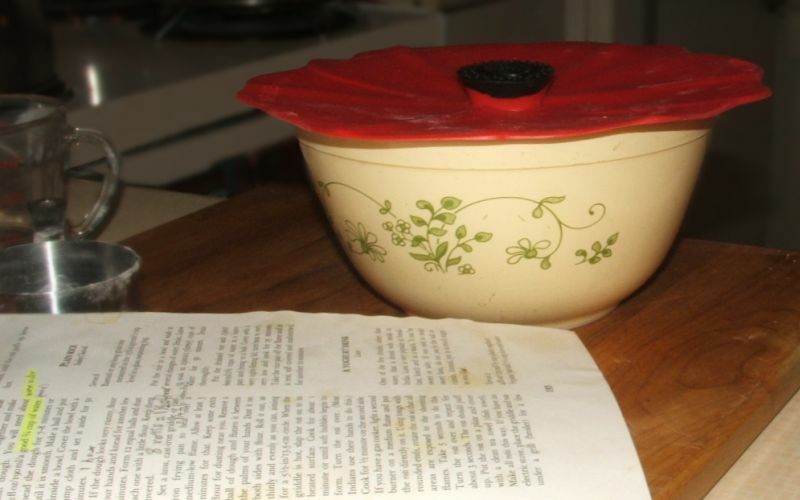 Store the finished bread in a lidded pot placed on a rack on an element on low heat. 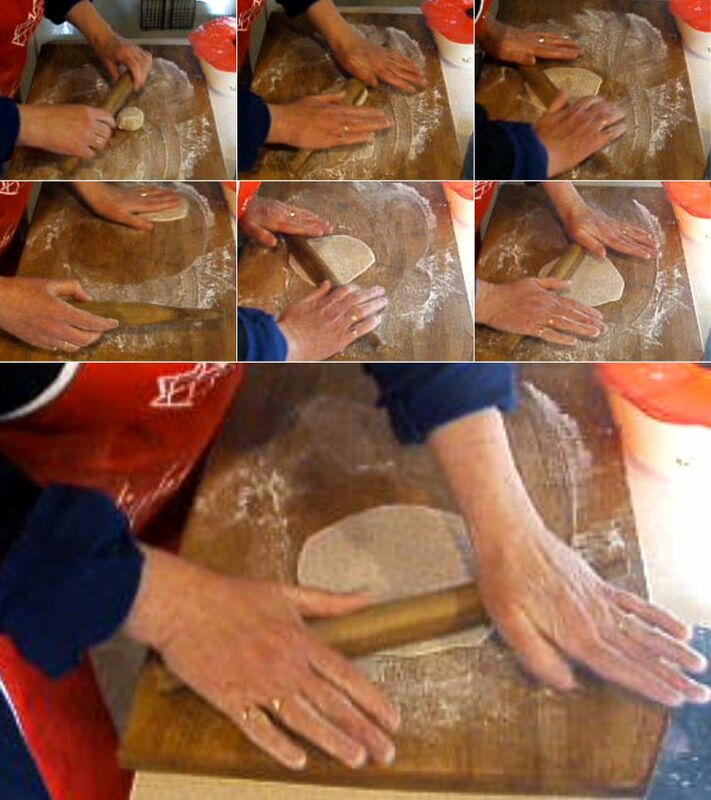 As each chapati is done, turn them over to prevent the bottom ones from getting soggy. 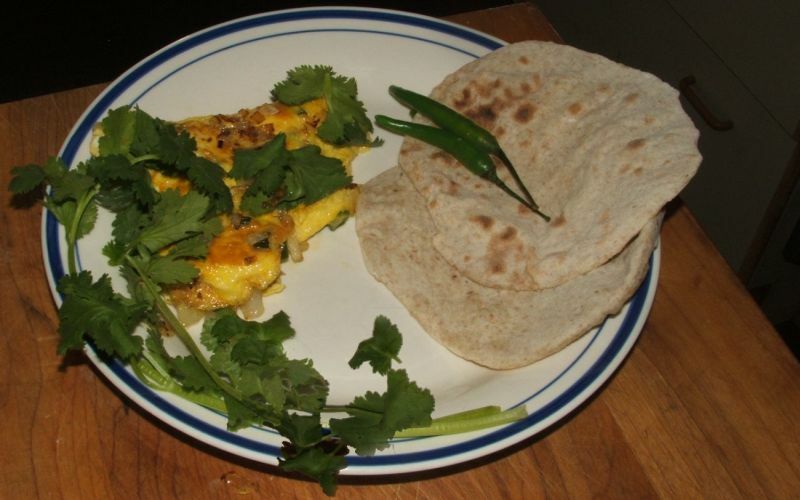 We served the hot chapatis with a green chilli omelette garnished with coriander leaf. What could be better?! Puff! Puff! Puff!! Chapatis (BBB January 2015) <<- includes recipe ~ Which Atta Should We Buy? What a dilemma!